There are all kinds of reasons to shop online. For us, it has more to do with convenience than anything else. We live in a rural area, and getting to any retail stores takes an hour of driving, a tank of gasoline, and all my patience. Thankfully, most everything I need to buy can be found online. Box Tops for Education has been serving shoppers like me with their online marketplace for the past few years, and I couldn't be happier. In addition to being able to shop my favorite online stores (and being able to skip the chaos that shopping holidays like Black Friday can bring), I can earn money for my local school without doing anything extra. The online marketplace doesn't require me to do anything but start my shopping at the marketplace homepage. It is even more convenient than my typical online shopping experience because it allows me to search for the item I'm looking for and then provides me with all the online stores that sell it. 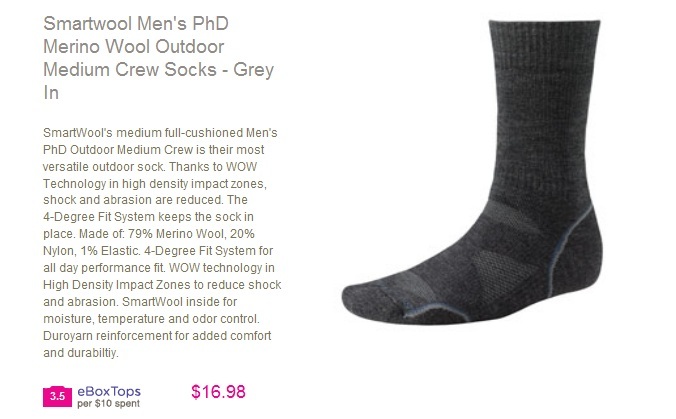 I decided to buy my husband a pair of Smartwool Phd socks (because I love mine so much), and I used the online marketplace to find the right style and the right price. Clicking on any particular item would bring up more information, so I knew I was picking the right store before I shopped. From there, I shopped as usual at the Campmor site. My purchase was a success! I found a great deal on the socks I wanted, and my school earned 14 eBox Tops. I didn't have to do any extra work! You can do all of your holiday shopping online at the Box Tops for Education online Marketplace, too! Wanna Win? We are giving one lucky reader a $50 gift card to spend at the online marketplace. To be entered to win, just which store in the marketplace you would shop at! You have until November 30th at 11:59pm CST to get your entries in. You may enter every day. (Please answer the question for the first entry. Each entry after that can be "enter me.") Don't forget to enter our other blog giveaways while you're here! * A gift card was provided for me to be able to try out the marketplace. All opinions are my own.